Failure to install the gas boiler in a private house is a risk to face a number of serious problems. Such violations are most likely to become the primary cause of fire, explosion, carbon monoxide poisoning, incorrect and uneconomical operation of the equipment. Due to inconsistencies, the gas service is guaranteed to refuse to connect and commission the boiler. After reading this material, you can protect yourself from the above troubles. Next, the data and numbers taken from the corresponding SNiPs are used. 1. It is necessary to start by submitting an application for approval of technical conditions. The presence of this document entitles the applicant to begin the installation and connection of heating equipment to the central gas main. The application is made in the gas service, where it is considered by specialists within thirty calendar days. In order to speed up the receipt of the above document and to avoid possible interruptions, the application must indicate the estimated average daily volume of natural gas that will be required to provide heating needs. This figure is calculated individually according to the standards given in the first of the listed SNiPs. For a domestic gas boiler with a hot water supply circuit used in central Russia, fuel consumption is 7-12 m 3 / day. The cooking gas stove consumes 0.5 m³ / day. The use of a flow-through gas heater (gas column) consumes 0.5 m³ / day. For a number of reasons, after consideration by the gas service of an application for permission to connect, a refusal may be given. At the same time, the responsible authority is obliged to issue a document to the owner of a private house, which officially indicates all the reasons for the refusal. After their elimination the application is submitted again. 2. The next step after receiving the technical specifications is an even longer, but necessary process - the creation of the project. The main part of this document is a plan-diagram, which shows the location of the boiler, accounting equipment, gas pipelines, as well as all connection points. An appropriate specialist is always involved in drawing up a project. He must have permission to do this work. By own efforts to develop the project it will not turn out. In any case, the gas service will not accept a document prepared by a non-expert. After drafting the project, it must be submitted for approval. This is done by the gas service department that controls the gas supply in a particular locality or area. As a rule, it takes up to 90 days to approve the project, and only after receiving a positive answer can the construction of the boiler room and the installation of the heating unit begin. document confirming compliance of specific equipment with safety requirements. It is also recommended to consult with the project specialist. He will provide the most up-to-date information on these issues, talk about possible innovations, changes in legislation and frequently encountered pitfalls. This knowledge is guaranteed to save you a lot of time and nerves. Coordination of a project, similarly as the receipt of a specification, may result in refusal. In this case, the owner is given a prescription, which indicates errors, omissions or inconsistencies that must be eliminated. After corrections, the application is submitted and reviewed again. Comprehensive information on the proper preparation of the premises is contained in one of the above documents. 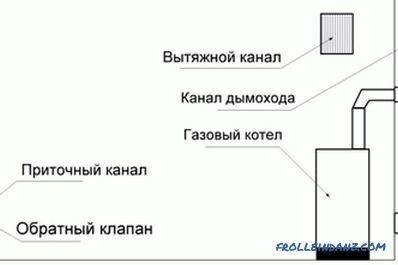 Including, there are instructions on the dimensions of the boiler room, the arrangement of the entrance door, the height of the ceiling and other important parameters (see below for the key requirements). 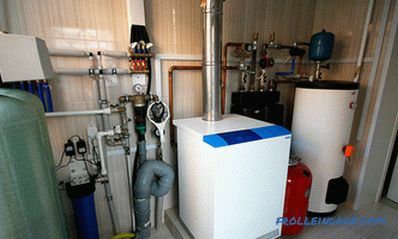 Immediately it should be noted that if the maximum heat output of a gas boiler is more than 30 kW, then it is necessary to allocate a separate room for its installation. 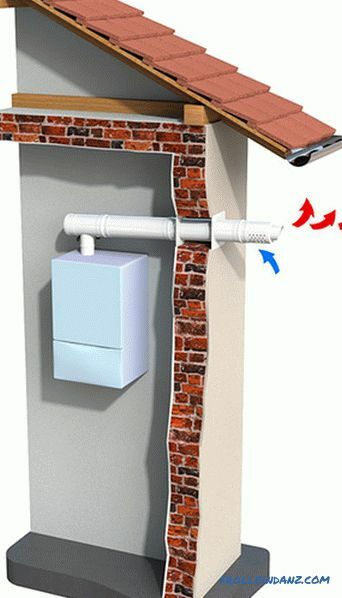 Models with lower performance and with the appropriate location of the outlet under the chimney can be installed, for example, in the kitchen room. It is strictly forbidden to install a gas boiler in the bathroom.It can not be installed in the bathroom, as well as in rooms that are considered residential purposes. As an alternative, the arrangement of the boiler room in a separate building is allowed. At the same time, take into account their own rules, which are the information below. A boiler room in a private house can be equipped on the basement level, in the attic (not recommended), or simply in a room specially equipped for these tasks. Area not less than 4 m 2 . One room is calculated for no more than two units of heating equipment. Free volume is taken from 15 m 3 . For models with a small capacity (up to 30 kW), this figure can be reduced by 2 m 2 . From the floor to the ceiling should be 2.2 m (not less). 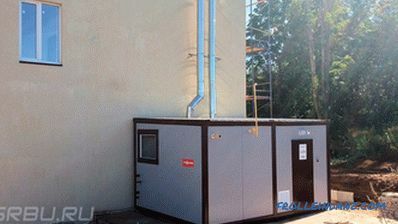 The boiler is installed so that the distance from it to the entrance door is at least 1 m; It is recommended to build the unit near the wall, which is located opposite the doorway. At the front side of the boiler, at least 1.3 m free distance must be left for adjustment, diagnostics and repair of the unit. The width of the entrance door is taken in the region of 0.8 m; it is desirable to open it out. Surface finishes should not be made of materials prone to overheating or fire. A separate power supply line is connected to the boiler room to connect the lighting, pump and boiler (if it is volatile) with its own circuit breaker and, if possible, with a RCD. Particular attention should be paid to the arrangement of the floor. 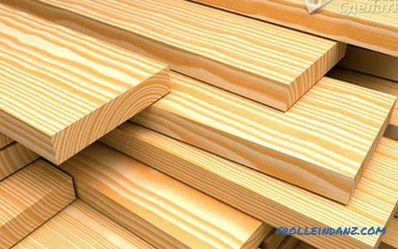 It must have a solid base in the form of a rough tie with reinforcement, as well as a topcoat made of absolutely non-combustible materials (ceramics, stone, concrete). To make the boiler easier to expose, the floors are made strictly on the level. On a curved surface, the installation of the boiler may be difficult or impossible due to insufficient departure of the adjustable feet. 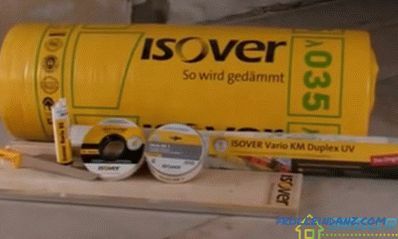 Putting under them third-party items to align the unit is prohibited. If the boiler is not installed evenly, then it may work incorrectly, with increased noise and vibrations. To fill the water heating system and feed it during operation, you must enter the cold water supply system into the boiler room. To drain the system for the period of maintenance or repair of equipment in the room settles down the sewer point. 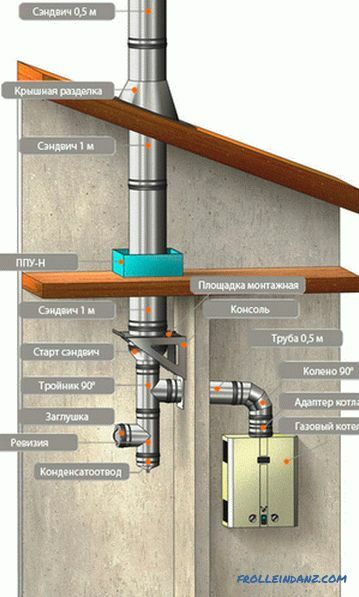 Special requirements are imposed on the chimney and the provision of air exchange in the boiler house of a private house, because this issue is considered in a separate sub-paragraph below. the water supply should be organized in such a way that in the cold season does not freeze highway. Mini-boiler room mounted near the house. Floors, walls and ceilings of a separately equipped boiler room must also be made and finished with materials that correspond to the class of non-combustible and heat-resistant ones. 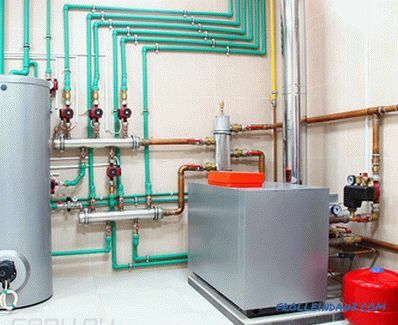 The current standards for installing gas boilers in private homes provide for a number of requirements for the organization of normal air exchange in a boiler room. In particular, one should be guided by the rule that the installed ventilation system should, in an uninterrupted mode, ensure a threefold renewal of air in a room in one hour. If the ventilation arrangement norms are neglected or the system is not sufficiently productive, the boiler will not function correctly due to lack of oxygen. The inflow of fresh air is needed to prepare a combustible fuel mixture, and because of its lack of a boiler will not work stably. Moreover, insufficient air exchange will cause carbon monoxide accumulation in the boiler room, which is deadly to humans! For example, consider a low-power gas boiler with a nominal heat output of 23 kW.According to the manufacturers' instructions, modern models with such capacity burn about 2-2.5 m 3 gas in one hour. In order for this volume to completely burn out, at least 30 m 3 of fresh air must flow into the boiler in the same hour. If it is less, gas will not be completely burned, which will adversely affect the efficiency of the heating system of a private house. For other modifications, the rate of fresh air inflow is usually indicated in the specifications and related documentation for gas equipment. In the boiler room with a gas boiler, the supply and exhaust ventilation system is always installed, which provides not only fresh air, but also forced removal of carbon monoxide in case of disruption of the normal functioning of the chimney. It is best to equip the supply channel on the opposite side of the boiler, near the entrance door. For maximum efficiency, it should be as low as possible. Scheme of ventilation of the boiler room. The area of ​​the intake ventilation channel is calculated based on where the fresh air is drawn from. If it comes directly from the street, the channel section should be 8 cm 2 for each kW of heat output of the boiler. For example, for a 30 kW boiler, the ventilation duct area must be at least 240 cm 2 (this is a square with sides approximately 15 cm long). 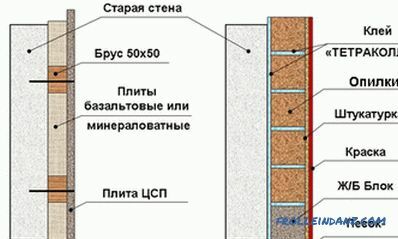 If the air is taken from the next room, the cross section of the inlet channel increases to 30 cm 2 for each kW of heat output of the boiler (in our example, this is already 900 cm 2 , which corresponds to the square with the sides 30 cm). It is for the latter reason that it is recommended to organize the flow of fresh air from the street. It is recommended to equip the boiler in the immediate vicinity of the chimney. Gas boilers with a closed combustion chamber are equipped with a coaxial chimney. 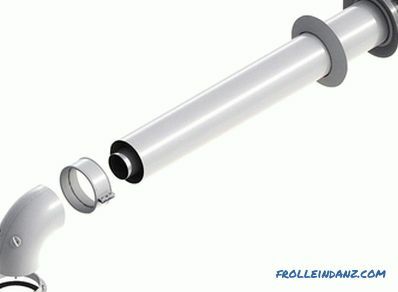 Coaxial chimney consists of two pipes of different diameters, which are inserted one into the second. Thus, the boiler can take oxygen from one pipe and remove the combustion products through the second. This design feature allows you to operate such boilers without the organization of additional ventilation. Coaxial chimney of the horizontal type. For boilers with an open combustion chamber, a conventional (traditional) chimney is required. For such boilers, the presence of ventilation is mandatory. The cross section of the duct under the chimney should correspond to the diameter of the outlet opening on the boiler. This value can be found in the technical description of the purchased boiler model. Along with this, it should be borne in mind that for boilers with an open combustion chamber and a heat output of up to 30 kW, the diameter must be at least 13 cm, and for 40-kilowatt - 17 cm. On the way from the boiler to The walls of the chimney should have as few bends and turns as possible (but not more than 3). Best of all, if they are not in the room at all. To do this, in many modern gas boilers there are two outlets - one on top and the other on the back side. 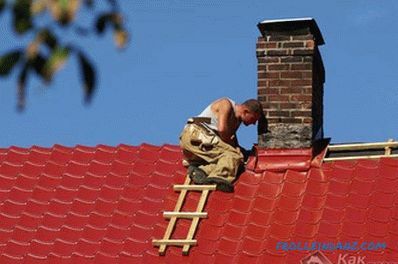 The chimney pipe must be made of stainless or carbon steel sheet. The use of asbestos pipe is also allowed, however, from its beginning to the boiler outlet pipe there should be a minimum distance of 50 cm. It is strictly prohibited to connect such a pipe directly to the boiler. Above the roof without a ridge, the pipe must rise 0.5 m.
The pipe going out onto the slope at a distance of up to 1.5 m. From the ridge should rise 0.5 m from the ridge. If, with the same configuration, the pipe is removed from the ridge at a distance of 1.5 m to 3 m, then its upper cut must be not lower than the level of the ridge. 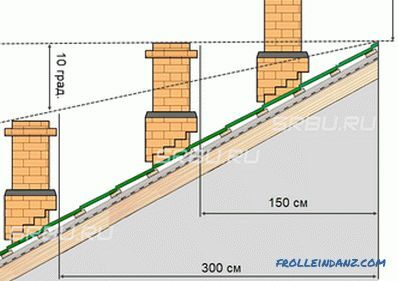 If the pipe goes into a slope farther than 3 meters from the ridge, then its upper cut should be no lower than a conventional line drawn from the top of the roof at an angle of 10 ° relative to the horizon. In accordance with the rules for installing a gas boiler in a private house, the table below shows the distances between the key points, within which is the positioning of the heating equipment. Floor boilers are installed on a previously prepared rigid and level base. The unit must be located on all the standard legs at the same time. At the same time, its position relative to the horizontal and vertical is controlled. Wall-mounted boilers are, by default, hung on specially designed brackets. It is categorically not recommended to use external fixtures for these purposes. 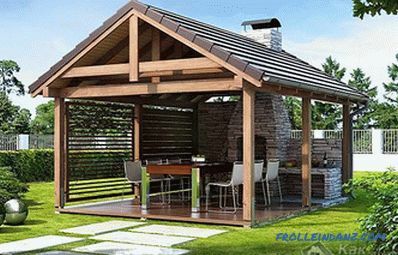 Particular attention should be paid to the reliability and carrying capacity of installed canopies. To fix them on the wall, use dowels with impact screws or anchor bolts of the appropriate diameter and length. 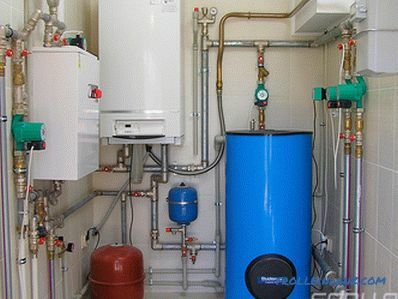 After installing the boiler, all the necessary communications are brought to it - water supply, sewerage, branches of the heating system, and power supply (if necessary).